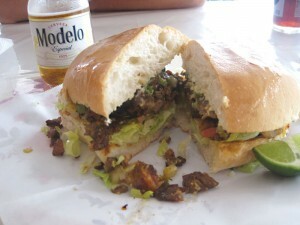 I knew from the first bite of the al pastor torta that the bread was all wrong. It was just soft all the way through – no shattering crust. The al pastor listing on the menu is, tellingly, translated as “pineapple pork”; Espinoza’s version is very pineapple-y. There was no salsa, jalapenos or carrots on the torta, therefore no heat. There was a little too much mayo and no detectable levels of the promised avocado. My dining companion summed it up well, “this torta would be good in the absence of all other tortas.” In Sac, with our daunting trifecta of Lalo’s (reviewed October 2008), El Abuelo (September 2009), and Cuidad Nezahualcoyotl (ditto), this is decidedly not the case. The tacos are better and are absurdly cheap – one buck! That’s less than most taco trucks. It’s almost suspiciously low. The cabeza taco is a satisfying bit of long-grained, deeply-flavorful beef, the lengua chunks had been artlessly hacked into off-puttingly large pieces, the suadero (chopped brisket) had a good crunchy texture. The green salsa on top of two out of the three tacos was unpleasantly foamy. I’d put Espinoza’s odds for success at 50/50; there’s a lot of competition on Franklin’s Taco Trail. I’d put Pho Saigon Bay’s odds even lower. The cavernous recesses of Pho Saigon Bay used to house a restaurant called Bun Nguyen Du Hue (reviewed September 2008). The specialty of this restaurant was bun bo hue, a spicy beef soup, and, fittingly, it was the first place I ever sampled this dish. Their version was excellent, and I marveled at the fun texture of the pig knuckles, which are sadly often left out of bun bo hue at other restaurants. 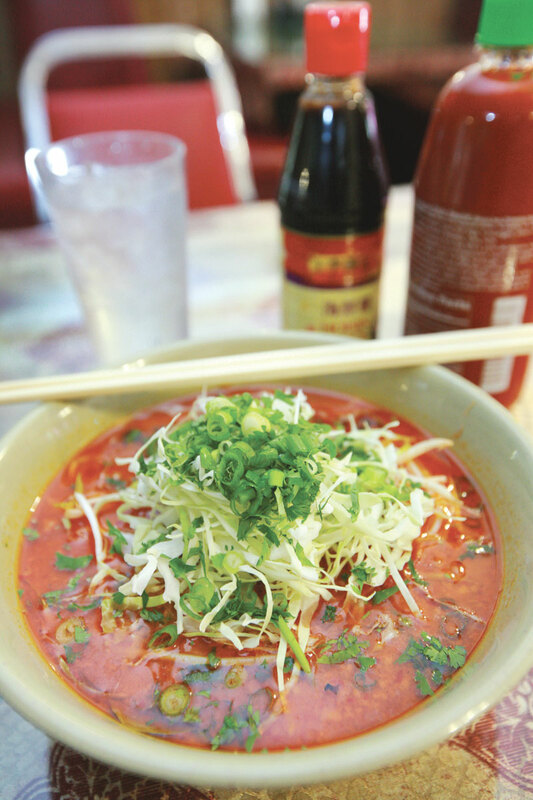 Pho Saigon Bay is a small chain, with outposts in Stockton and near Sac State. The owners seem to be very into promotion: there’s a toilet bowl-sized “pho challenge” portion (anyone who can eat it gets a $25 dollar gift certificate and their photo on the “wall of fame,” which was still empty on my visit), there’s a two-for-one pho ga deal going on, there’s even a kid’s menu, which is pretty cool, although Vietnamese food prices are already so ridiculously low that I’m not sure it’s needed. Saigon Bay could do well to drop the promotion and focus on the food. The flavor of the pho broth lacked depth and complexity, and even salt; there were not enough sliced onions and scallions to add crunch, and there were only two measly pieces of tendon. The bun with grilled pork had the same problem of overly-soft noodles that also afflicted the pho, and the lightly gamy grilled pork could not hold a hoof up to that of the standard bearer, Huong Lan. Even the fish sauce concoction to pour over the bun was not fishy enough! In the face of all this lack, there was one unwelcome addition in the pho: a piece of hair. On a happier note, the speedy substitution of one Laotian restaurant for another in the strip mall across from the Campbell’s soup factory seems to be going gangbusters. Empty King Pham (December 2010) was run by the rather forlorn owner; the new occupant – chock-full-o-families Laos Kitchen, was being briskly manned by two teenage girls in pageant-worthy hair and fake fingernails on the day that I visited. The papaya salad at Laos Kitchen had a heavy anchovy taste and was studded with charred peanuts; the taste of the peanuts married wonderfully with the flavor of the chopped tomatoes and the sweet, fishy sauce. Rather than the customary huge wedge of cabbage, the cabbage served with the papaya salad at Laos Kitchen was finely chopped, a small touch which says a lot. 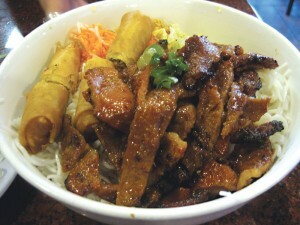 A sign outside Laos Kitchen enthusiastically exclaims, “We now have kasoy 7 days a week! 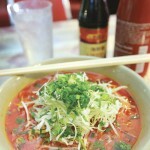 !” – a soup which King Pham also offered. I liked the kasoy at both places, but the ground pork in the kasoy at Laos Kitchen was wonderfully browned and crispy around the edges, which really edged it over the top. The tripe-laced beef larb at Laos Kitchen tasted more of lemon than lemongrass, and was unusally minty. I like the sassy vibe of Laos Kitchen, including the proclamation on the menu “we use fish sauce and MSG.” I have a feeling it’s here to stay. 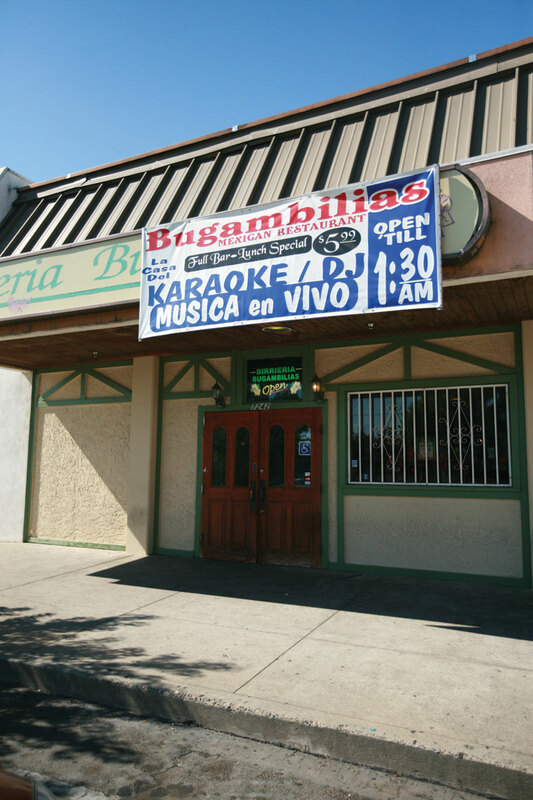 Also seemingly here to stay is the very first restaurant I ever reviewed for MidMo (June 2006 – back when it was still called Midtown/Downtown Monthly), Birrieria Bugambilias. As I peer through the golden mists of time (oh hi, intense love for Morrissey!) I recall that I liked it – but I never went back. That’s the way things go sometimes with places I review. There are just a lot of fish in the South Sac Sea. There have been a couple of changes at Bugambilias. 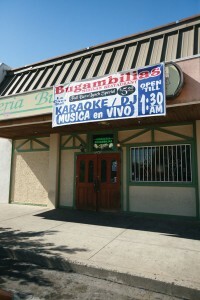 It now it sports a sign outside saying it has karaoke until 1:30 AM; it also has a small stage in back and a disco ball. There are exposed concrete floors, a partially open kitchen, stately high-backed carved-wood chairs, and a funny, wee little office near the front door where the cashier sits. I was delighted to be reminded that the regional focus of Birrieria Bugambilias is Michoacan; I just returned from a one week trip to that state. I didn’t encounter any deep-fried tacos on my vacation, but Bugambilias lists them as regional specialties. The tacos, filled with mashed potato, luscious beef, or chicken were delicious in a terribly-bad-for-you-way. BB makes their tortillas by hand, so even crisped in fat the fresh corn flavor came through. I jumped on the chance to order the morisqueta, a rice and beans dish which I had just sampled in Uruapan, despite the fact that I had found that meal to be bland. The version at Bugambilias could not have been more different. It’s a full, hearty, meal of two mounds of pillow-soft white rice topped with tangy crema and cheese, surrounded by hunks of baby back ribs, all swimming in a spicy, rich tomato and pinto bean sauce. I declared this same dish “heavenly” in my original review, and then promptly forgot all about it. Reader, don’t make this same mistake! This single dish was better than any I had on my vacation; when I told the owner that she grasped my hand in happiness. Taqueria Espinoza, 2805 12th Ave.